Lovely Pocono retreat located on water between Larsen and Natalie Lakes within the Big Bass Lake Community (BBLC). Spacious living room with, vaulted ceilings with skylights and stone fireplace. Sleeps 12 comfortably in 6 bedrooms with 3 baths. Fully equipped kitchen and dining area. Outside deck with hot tub. Screened-in porch area. You MUST be at least 25 to enter into an agreement. The house and how Joe handled our rental process exceeded our expectations. We are a group of 12 who rented the house for a relaxing weekend to celebrate a friend's birthday. The house is very spacious with everything that we needed for the weekend. Not having an A/C did not bother our group since the house is very well ventilated with fans at each rooms. The kitchen/pantry is fully stocked with basic kitchen needs and all of the appliances (trash compactor!). 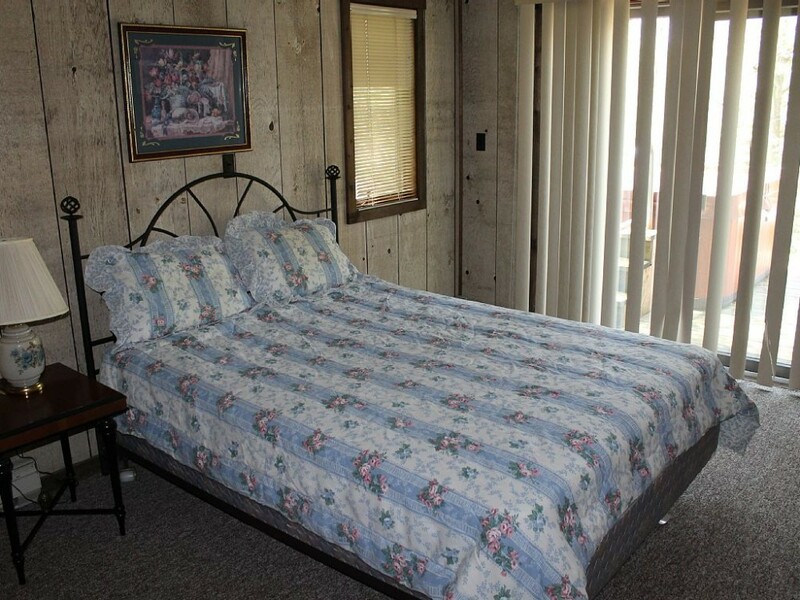 All bedrooms are clean with comfortable mattress and extra pillows (linens not provided). Bathrooms are very clean and all are in good condition. The sauna in the 2nd floor bathroom is our favorite. Bedroom Jacuzzi is a huge addition in the bathroom but needed an upgrade due to the jets not working well but we still enjoyed it after using the sauna. The hot tub is another favorite item in the house especially at night, it is a decent size with nice jets so it compensated the Jacuzzi upstairs. We really did not stay on the deck as there were no adequate lights at night but we enjoyed our time downstairs using the fire pit. The lake is underwhelming at the beginning but that feeling changed when discovered the other lake and small waterfalls on the other side. Overall our stay is one of the most memorable rental experience of the group. We are considering on renting again next year. Had a fantastic time this past weekend with the family- 10 adults and 4 dogs total! The owners were very accommodating with additional requests to make our stay even better. We were looking at the photos online for weeks before our trip and were blown away when we arrived in person! There was plenty of space for everyone to comfortably enjoy their stay. It rained all weekend, but the family spent our time watching movies on Netflix or playing all night in the game room. The rain didn't stop the guys from fishing all weekend- they even caught some of their first trophy fish! They also managed to catch a couple of hefty fines for not having fishing licenses or their life jackets on after ignoring all warnings to. The park rangers DO patrol the area OFTEN and do not care if you're on vacation, so make sure you are following all the rules even if you're only 5 feet away!! Nonetheless, we all enjoyed our weekend getaway with the whole family and can't wait to do it again next Summer! Beautiful Pocono home on the water. We recently stayed at the Christel's Pocono house for a week long vacation. It was the perfect house for our group of eight ( 5 adults and 3 teens). It was on a quiet cul-de-sac, yet minutes to the community pool, rec center and tennis courts. The house is on the water between 2 lakes. There are two canoes at the house which we enjoyed. When we first went over to the canoes the kids looked disappointed. They said they thought it would be bigger. When they came back those feelings changed. One group was telling us about a small waterfall that led to one of the large lakes and the other group was raving about going under a small bridge that opened up into the other large lake. Needless to say, for the rest of the vacation whenever the question "what do you want to do now?" popped up, the answer was "lets go out on the canoes." The house itself was very large and supplied with everything we needed. The master suite was amazing, with a sauna and Jacuzzi tub in the bathroom. We never got to use the Jacuzzi tub because outside on the deck was a beautiful hot tub that we used. Also on the large deck was a large gas grill and a number of tables and chairs. We brought along our dog and we were pleased to find that the deck was gated so we didn't have to worry about him running off the deck. Downstairs was a nice pool table, ping pong and foosball. Two of the boys chose to each take one of the two bedrooms that are next to the game room. We almost didn't book the house because there was no central air conditioning. ( A priority for my wife and sister-in-law). Joe (the owner) assured us that there were ceiling fans in every room and a/c probably wouldn't be an issue. He was right. The house was always comfortable and never too hot. Overall we had a wonderful stay, and look forward to staying here again in the future. Joe and Leanne we're very easy to work with to make our Poconos vacation perfect. Great hot tub and board games/ping pong/billiards a big plus. Inexpensive entrance fees to use the pool, beach, rec center. Easy trash disposal. This house is perfectly located in a quiet safe neighborhood near markets and attractions for fun for all ages.